The groovy sounds of a Cuba-based musical band wafted through the White House on Thursday for the first time in more than 50 years. 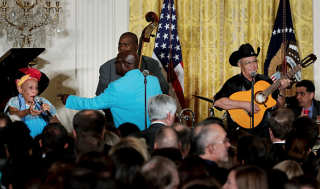 The Orquesta Buena Vista Social Club performed at a White House reception Thursday to mark Hispanic Heritage Month and the 25th anniversary of the White House Initiative on Educational Excellence for Hispanics. "It is wonderful to have you here. I was explaining to them that when the documentary about the Buena Vista Social Club came out, I was told it was around 1998, I bought a CD," said President Barack Obama, who asked the audience to "give it up" for the group. If you missed the performance, click here to watch it.